Everyone needs their own space and if you are fortunate to have enough room for that luxury, then use it well and appreciate it. And this is an ideal opportunity to really theme the room towards its intended use. For a very informal decor, minimal curtain treatments such as light voile curtains will set the scene for a relaxing mood as they gently waft in the breeze through an open door or window whilst also allowing for maximum light. Heavy full length curtains will not give the casual look just by virtue of the fact that they will not fall in sufficiently soft folds. You will of course have to arrange some kind of secondary window treatment such as roman blinds or roller blinds for shading to protect your furniture and soft furnishing fabrics from the sun and to give privacy at night. A light weight plastic curtain track such as the Integra Plastic Curtain Track is ideal for this kind of situation. Plastic curtain tracks are available in many shapes and sizes. Some tracks are supplied with their curtain hooks included as part of the glider mechanism and some are customized so you can buy in kit form exactly what you require. Plastic runners and gliders produce a smooth, quiet travel for the curtains on the curtain track. This type of curtain track is extremely versatile as plastic can be extruded into practically any shape or form. The track fixing position can be ceiling or wall fixed. Plastic can be easily bent by hand, so certain types of plastic track can be used as bay window track, being forward or reverse bent, easily trimmed, or joined for extra wide windows. Basically your colour scheme is the single most challenging part of designing a themed room – the style, mood and perceived temperature is all affected by your choice of colouring. Colour is a powerful tool for the transformation of light and space, but without any understanding can result in the faint hearted reaching for the tin of Magnolia paint or alternatively a decorative disaster. 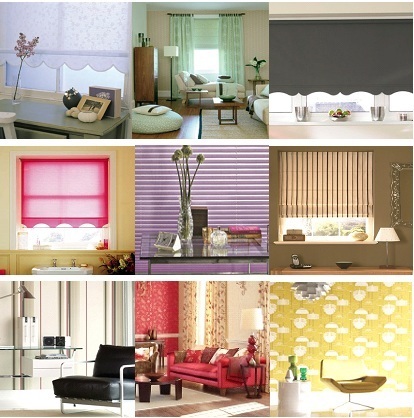 This collage of different coloured room interiors simply shows the effects of the different colours in a decor. Living in harmony with nature is always a sure way to create a mellow setting, so introduce as many natural finishes as you can. Wood weave blinds or many of the wood, leather or suede effect Roman or Roller Blinds are a good medium to work with for a natural finish. Lots of plants and the odd flower arrangement will also create a pleasing, relaxed setting. To draw attention to a particular object in your decor such as a work of art or a collection of glassware, selecting a blind in a matching colour will accent the objet d’art highlighting its colours, ensuring it remains the focal point of the room. Alternatively pale coloured window blinds increase the feeling of space, blending with neutral wall coverings, furniture and flooring.